Fourth of July Fireworks in Washington, D.C.
Washington, D.C., is a spectacular place to celebrate July Fourth. The National Mall, with Washington, D.C. monuments and the U.S. Capitol in the background, forms a beautiful and patriotic backdrop to America's Independence Day celebrations. This is an all-day event in the nation's capital, beginning with a parade along Constitution Avenue and ending with a spectacular display of fireworks over the Washington Monument. Following is a guide to all of the Fourth of July events on the National Mall as well as other fireworks locations in Maryland and Virginia. The Fourth of July celebrations in Washington, D.C., are among the most attended events of the year, and many people arrive early to stake out a seat on the lawn. There are plenty of activities scheduled throughout the day to keep the whole family busy. Planning to visit from out of town? See a complete Washington, D.C., travel planning guide with tips on the best time to visit, how long to stay, where to stay, what to do, how to get around the region, and more. It is a good idea to make hotel reservations as early as possible. See a guide to Washington, D.C., hotels for places to stay. If you would like to take a city tour, book one in advance because they get busy. Find out the best sightseeing tours in Washington, D.C. The best way to get to the National Mall is to take the Metro. Stations nearby include Smithsonian, Metro Center, Gallery Place–Chinatown, Judiciary Square, Federal Triangle, and L'Enfant Plaza. The Smithsonian station will be “entry-only” at the conclusion of the fireworks display. It typically takes 90 minutes to two hours to clear the Mall after the fireworks. Public access to the National Mall begins at 10 a.m., with all visitors required to enter via a security checkpoint. Read more about getting to the National Mall, public transportation, parking, security, and road closures. The Fourth of July parade features marching bands, military and specialty units, floats, and VIPs. The parade draws a large crowd, so plan to arrive early to stake out a good viewing spot. It starts at 11:45 a.m. and ends at 2 p.m. The route runs along Constitution Avenue between 7th and 17th streets (map). Read more about the National Independence Day Parade. See also Fourth of July parades in Washington, D.C., Maryland, and Northern Virginia. This annual event includes daily and evening music and dance performances, crafts and cooking demonstrations, storytelling, and discussions of cultural issues. The event is from 11:30 a.m to 6 p.m. Read more about the Smithsonian Folklife Festival. The National Archives celebrates the Fourth of July with special programming celebrating the signing of the Declaration of Independence. The celebration includes patriotic music, a dramatic reading of the declaration by historical reenactors at 10 a.m., and free family activities and entertainment by U.S. military bands. Seating on the Constitution Avenue steps is available on a first-come, first-seated basis. The event is from 9 a.m. to 4 p.m.
A Fourth of July tradition in the nation's capital includes a live concert by the National Symphony Orchestra and several pop artists performing patriotic music on the West Lawn of the U.S. Capitol building. 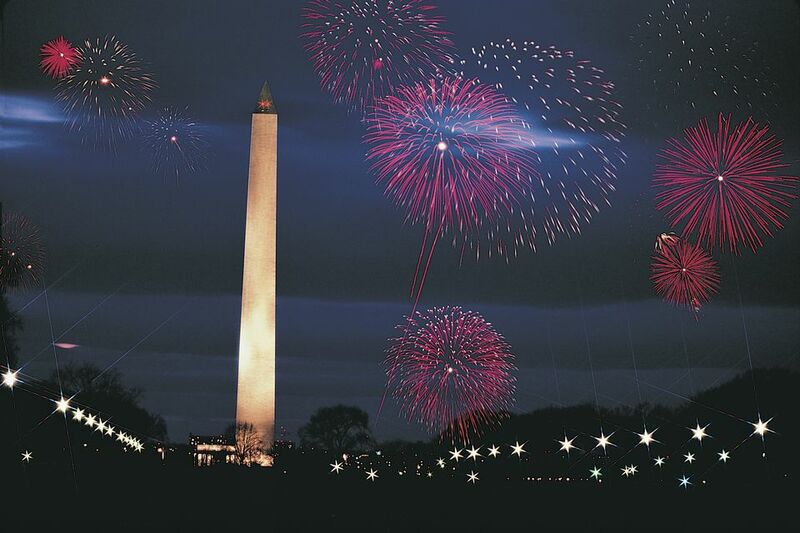 The concert and show are followed by a spectacular display of fireworks over the Washington Monument. The concert, which starts at 8 p.m., is free and open to the public. Admittance begins at 3 p.m. No tickets are necessary. The annual event will be broadcast live on PBS television and NPR radio stations. Read more and see photos of the performers for A Capitol Fourth. The fireworks are launched from the Lincoln Memorial Reflecting Pool and light up the sky over the Washington Monument. They begin at dark, which is usually close to 9:15 p.m. The fireworks will be canceled in the case of heavy rain, high winds, and thunderstorms. Rooftop bars in Washington, D.C. Spectacular views of the fireworks can also be seen from the Marine Corps War Memorial (Iwo Jima) in Arlington, Virginia, near the Rosslyn Metro station and areas along the Virginia side of the Potomac River that can be reached from George Washington Memorial Parkway. You may park at the Gravelly Point parking lot, which is about a quarter mile from the 14th Street Bridge. Another good place to watch the fireworks is from the Air Force Memorial on Columbia Pike. Another prime location to view the National Mall fireworks is at Long Bridge Park. Maryland has a variety of places to see fireworks on the Fourth of July. Most events are family-friendly and include live entertainment. Events are held on July 4 unless otherwise noted. Annapolis: Annapolis City Dock, Annapolis, Maryland. 410-263-1183. The parade starts at 6:30 p.m. and fireworks at 9:15 p.m. The parade follows West Street, around Church Circle, and down Main Street to Market House. Radio station WRNR will begin a live broadcast at 8 p.m. of a special holiday playlist and will then play a patriotic montage to accompany the fireworks display. Baltimore: The fireworks can be viewed from several locations in downtown and the surrounding areas, including Federal Hill, Fell’s Point, and Harbor East. Live music begins at 7 p.m. at the Inner Harbor Amphitheater, located at Pratt and Light streets. Fireworks are at 9:30 p.m.
Bowie: Prince George's Stadium, 4101 NE Crain Highway, Bowie, Maryland. There will be a fireworks display after the Bowie Baysox baseball game. For additional information and tickets, call 301-805-6000. Chesapeake Beach: Fireworks are June 30 at dusk. This is one of the largest fireworks displays on the Chesapeake Bay. Fireworks can be viewed from any spot along the water in Chesapeake Beach, North Beach, and Breezy Point. Rain date: July 3. College Park: University of Maryland, College Park. Parking Lot 1, off Campus Drive near the University Boulevard/Adelphi Road entrance. 301-864-8877. Food and music start at 7 p.m., with fireworks around 9 p.m. Rain date: July 5. Columbia: Lake Kittamaquandi, 10221 Wincopin Circle, Columbia, Maryland. 410-740-4545. The event begins at 5 p.m. and features music and children's entertainment. Fireworks are at 9:30 p.m. Rain date: July 5. Frederick: Baker Park, Second and Bentz streets, Frederick, Maryland. 301-228-2844. A full day of activities begins at noon. Highlights include music on multiple stages, fireworks, and more. Gaithersburg: Bohrer Park at Summit Hall Farm, Gaithersburg, Maryland. 301-258-6350. A concert, fireworks, and activities will be held from 11 a.m. to 11:30 p.m. on June 30. Rain date: July 1. Greenbelt: Buddy Attick Park, 555 Crescent Road, Greenbelt, Maryland. 301-397-2200. Entertainment begins at 4 p.m. with fireworks at dusk. Laurel: Granville Gude Park, Laurel Lake, Laurel, Maryland. 301-725-5300 ext. 44. A parade starts at 11 a.m. with fireworks at 9:15 p.m. Ocean City: Two locations: North Division Street (Inlet-27th) and Northside Park at 125th Street, Ocean City, Maryland. Celebrate Independence Day with a free concert at 8 p.m. followed by fireworks at 9:30 p.m. at both locations. Poolesville: Poolesville Polo Grounds, 14660 Hughes Road, Poolesville, Maryland. 301-972-8888. Live music begins at 6 p.m. and fireworks are at 9 p.m. Parking is $5 a vehicle. Rockville: Mattie J.T. Stepanek Park, 1800 Piccard Drive (King Farm), Rockville, Maryland. Live entertainment begins at 7 p.m. with fireworks at 9:15 p.m.
Six Flags America: Mitchellville, Maryland. 301-249-1500. The amusement park sponsors a spectacular fireworks display on July 4 at 9:15 p.m. Enjoy a full day of family entertainment starting at 10:30 a.m. when the park opens. Solomons: Riverwalk, Solomons, Maryland. The waterfront community hosts an afternoon street fair and fireworks. The street fair begins at 3 p.m. with fireworks at 9:15 p.m.
Takoma Park: Takoma Park Middle School, 7611 Piney Branch Road, Takoma Park, Maryland. A parade begins at 10 a.m. at the intersection of Carroll and Ethan Allen Avenues. Fireworks are at 9:30 p.m.
Waldorf: Regency Furniture Stadium, 11765 St. Linus Drive, Waldorf, Maryland. Highlights include "Taste of Charles County," live music, children's activities, and fireworks. Entertainment begins at 4:30 p.m. with fireworks at 9:15 p.m. Here are some places in Virginia to see Fourth of July fireworks. Events are held on July 4 unless otherwise noted. Alexandria: Oronoco Bay Park, 100 Madison St., Alexandria, Virginia. Celebrate Alexandria’s birthday and the United States' birthday on July 7, 2018, from 7 to 10 p.m. Enjoy fireworks at 9:30 p.m.
Fairfax: Fairfax City. 703-385-7858. The Independence Day Parade goes through the downtown area beginning at 10 a.m. Musical entertainment starts at 6 p.m. at Fairfax High School with a spectacular fireworks display at 9:30 p.m.
Falls Church: George Mason High School, 7124 Leesburg Pike, Falls Church, Virginia. Live music will start at 7 p.m. followed by fireworks at 9:20 p.m.
Herndon: Bready Park, Herndon Community Center, 814 Ferndale Ave., Herndon, Virginia. 703-787-7300. Games, bingo, and crafts begin at 6:30 p.m. Music starts at 7:15 p.m. Fireworks are at 9:30 p.m.
King's Dominion: 16000 Theme Park Way, Doswell, Virginia. Independence Day activities include fireworks and military bands. Active and retired military service members get in free. Leesburg: Ida Lee Park, Rt. 15 (King Street) and Ida Lee Drive, Leesburg, Virginia. 703-777-1368. A parade starts at 10 a.m. at Ida Lee Park. Gates open at 6 p.m. Fireworks begin at 9:30 p.m.
Manassas: 9431 West Street, Manassas, Virginia. 703-335-8872. Enjoy live music, children’s activities, food, and fireworks. Entertainment begins at 4 p.m. with fireworks at 9:15 p.m.
Mount Vernon Estate: George Washington Parkway, Mount Vernon, Virginia. 703-780-2000. The estate will host evening fireworks on June 29 and 30. Admission is $30 an adult, $20 a child (for an additional $5, you can tour the mansion). Daytime fireworks will also be displayed at 1 p.m. during the annual Independence Day event on July 4. Reston: Lake Fairfax Park, 1400 Lake Fairfax Drive, Reston, Virginia. 703-471-5415. A whole day of fun begins at 7 a.m. on June 30 and includes live music, a puppet show, boat rides, swimming in the Water Mine, and fireworks, which begin around 9:15 p.m.
Vienna: Yeonas Park, 1319 Ross Drive SW, Vienna, Virginia. Live music begins at 7:15 p.m. and fireworks begin at 9:15 p.m.
Williamsburg: At Colonial Williamsburg, enjoy live entertainment, a dramatic reading of the Declaration of Independence, performances by the Fifes and Drums, and fireworks in a patriotic setting. Celebrations begin at 9 a.m. Fireworks are at 9:20 p.m. ​​Busch Gardens celebrates with a patriotic tribute. The theme park will have fireworks at 9:30 p.m. on July 3, 4, and 5.